Resource Software Int'l Ltd. (RSI) is a world leader in producing products, training and resources that manage, control and increase adoption of collaboration systems resulting in a more productive communication ecosystem. Visit www.telecost.com. Team collaboration applications are disrupting traditional ways of communication. The most popular solutions integrate voice, video, chat and virtual meeting spaces to rapidly enable colleagues to share ideas, build consensus, establish direction and or accomplish specified objectives. Many organizations can now consolidate existing communication tools into a single platform deployed across the entire enterprise. There is a new breed of team collaboration solutions jostling for market share by major heavyweights including Cisco Spark, Microsoft Teams and RingCentral Glip alongside pioneer Slack. All vendors promise a unified experience but in practice many organizations remain hamstrung by investments in legacy systems and fragmented multi-vendor landscapes. However, the solutions themselves do offer robust all-in-one converged collaboration experiences. This has emboldened many organizations to move towards a consolidation of systems rather than separate vendors for voice, video, meetings and team collaboration. Diving into team collaboration is only effective if stakeholders embrace the new technology otherwise there is even greater frustration from navigating between multiple applications. Managers need to make sure that new communication platforms are being adopted and improve business outcomes. At Enterprise Connect 2018 in Orlando, Florida last week, Jason Kasch, CIO at Structural Group, a Maryland-based engineering and construction firm, said his company previously used a range of applications to connect workers – including Microsoft Yammer, Oracle Social Network, text messaging platform GroupMe and team collaboration pioneer - Slack. By standardizing on one converged platform, RingCentral Glip, the company found it easier for employees engage others within the organization across multiple locations in several time zones. Kasch said the greatest advantage from the deployment of RingCentral Glip team collaboration was the elimination of time spent flipping between applications to share content with others. Cisco Spark was touted for its simplicity and quality of meeting experiences. Cisco leverages its vast experience in meeting quality and end-to-end secure encryption of collaboration data. 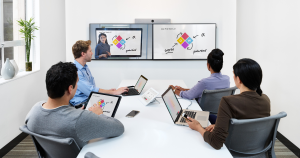 Cisco Spark coupled with WebEx builds a compelling case for using Cisco team collaboration. Jonathan Rosenberg, VP and CTO of Cisco’s Collaboration Technology Group, argued that Spark is best positioned to address disjoint communications by creating “a wrapper around the stuff you already have and make it better.” Rosenberg offered an example of a major U.S. retailer that utilizes Cisco Spark in-store for internal chat and across the enterprise for corporate communications. He also touted how NBC Universal leveraged Cisco Spark in the broadcasts from the recent XXIII Winter Games. More than ever before, managers are faced with selecting between a vast array of communication tools. The selection process may be complex but what happens when a chosen solution is deployed is even more daunting. Migrating from traditional premise based PBX solutions to all-encompassing cloud-based team collaboration requires a general shift in workplace culture, buy-in from all stakeholders and maximum adoption. People need to leave old ways of doing things behind. Team collaboration analytics is needed to make sure selected tools are being adopted, reduce decision times and improve collaboration. The old adage once again rings true – you cannot manage what you cannot measure. Team collaboration analytics are imperative for making intelligent decisions about the lifeline of every enterprise. Founded in 1990, RSI is a world leader in producing products, training and resources that manage, control and reduce the expense of communication facilities resulting in a more dynamic, responsive and productive communication ecosystem. RSI offers communication management solutions for premise, hybrid and cloud environments that empower enterprises to increase adoption of new technologies, remove bottlenecks, reconcile expenses and improve customer experience. Core solutions include call accounting, call center reporting, real time dashboards, emergency notification and team collaboration analytics. The company also offers professional services for building custom integrations that connect technologies together. (c) 2016, Resource Software International Ltd. (RSI). Simple theme. Powered by Blogger.